Drink plenty of water—one of the most basic health rules reconnects you with nature’s main healing element. Especially when infused with fruits and herbs, drinking plenty of water can bring with it nature’s healing effects. For your digestive health, consider these key ingredients for infusion drinks. Infusion drinks can also promote good digestion and regular bowel movements. Try these fruits and herbs in your after-meal beverage. Also the key ingredient in master cleanse, lemon produces digestive enzymes that trick the liver into producing bile, ensuring that food moves through the body and gastrointestinal tract smoothly. Find relief from an upset stomach with mint leaves such as peppermint. These herbs do an excellent job in calming the muscles and improving bile flow in the gut. Soothe your tummy with a refreshing brew of Aftermeal Treat. 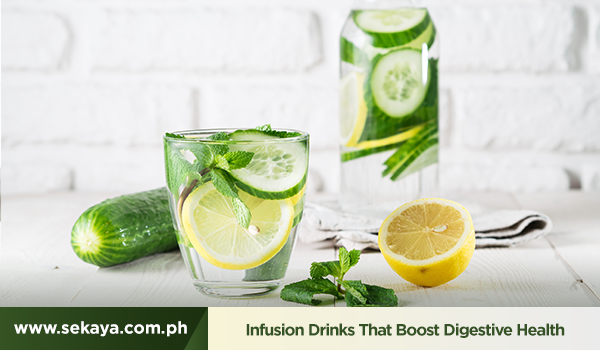 Low in calories and high in fiber, thinly sliced pieces of cucumber in your infusion further gives water’s hydrating and refreshing quality a boost while promoting healthy bowel movements. Cinnamon has been found to warm and stimulate the digestive system. It helps in food processing by breaking down fats and sugar during digestion. Ginger helps relieve cramps, gas, and indigestion, while stimulating the breakdown of food particles. Have ginger in your daily digestion infusion drink with Regular Move. Discover nature’s healing and empowering gifts in every Sekaya botanic infusion.